Zion's Ebony Wings-Eagle's Nest :: When Ebony first came home with us at the age of 3, she'd spent 3 years of her life in a kennel and had virtually no training. Thanks to wonderful fostering, she'd spent some time living in a house, but she knew nothing about what a leash was for. Everyday things around the neighborhood like a lawnmower, trash can, or person standing behind a fence were new and scary. She had no idea how to relate to other dogs, much as she wanted to. Even worse, she'd already lost two potential homes because of concerns about aggression during the transition. 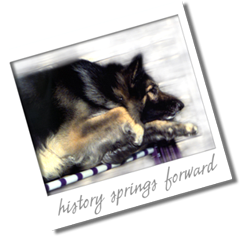 Knowing this history, her training started immediately upon her arrival to the house. 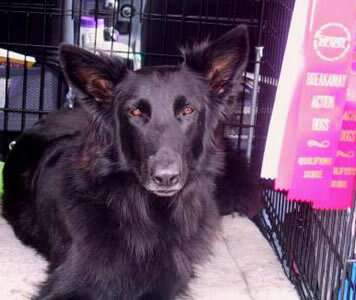 From the beginning, my hope was that Ebony would someday be able to compete in agility. When we started training, it wasn't clear whether that was a realistic goal. She was highly excitable and leapt at other dogs even in basic obedience class. We tried agility class after she achieved her CGC, but the high energy level was way too much for her. She really enjoyed and excelled at formal obedience, so we kept at that. In less time than I could have imagined, Ebony became more and more confident, calm, and comfortable. Ebony is a smart dog, and learning to heel was always easy to train; learning to relax and to work in a distracting environment is the hard part! It was easy to gravitate toward Rally because it combines some of the best aspects of traditional obedience and agility. Like traditional obedience, it is required to know obedience movements like heeling, fronts, finishes, and well-executed turns. And like agility, the competition involves a course that you run independently with your dog, you can talk to your dog, and it's not necessary that movements have clockwork precision. Rally-O itself is focused on the relationship between handler and dog, and provides an encouraging and low-key competition venue to trial a dog. For me, the handler, it has been more fun to train for Rally-O than for traditional obedience because of its less serious nature. Our hard work paid off on October 16, 2005 when Ebony earned her Rally Level 1 (RL1) title at Breakaway Action Dogs in Frederick, MD! So many months I'd despaired that Ebony would never, ever learn to walk on a loose leash, and imagined that she'd never in her life be able to walk calmly through a crowd of strange dogs (or any dogs!) We kept at it, attended class regularly, practiced, went to run-throughs, and when it was time to strut her stuff, she came through with a scores of 181, 187, and 189 (out of 200)! Even more than earning the title, I was so proud of the way she handled herself at the trial: well-behaved waiting outside the ring for her turn, and calm and relaxed while crated out in the car between classes. No matter how well she ever does in the ring, we can only trial if I feel like she wants to be there... and she did! Next up for Ebony will probably be her Companion Dog (or equivalent) formal obedience title. Thanks to her Rally training, she already knows most of what she needs for the title and the one who requires the most polishing up is me! We've also started agility again, and now that she has confidence, I'm delighted to discover that she really enjoys it. With luck, we may be able to start trialing next summer. The best thing of all to come out of our training, though, is that this poor dog that used to vomit on any five-minute car ride now tries to get in the car every time we go past it on a walk. That's just one symbol of how far she's come. There's absolutely nothing better than the knowledge that my girl has gone from being afraid of the world to truly living in it.